Preserving the harvest is a great way to get more out of your garden! Sometimes the garden gives a ton of surplus. Learning to dehydrate greens and herbs is a great way to preserve vital nutrients and flavors for later use. You can dehydrate greens and herbs with very little effort and their uses are limitless. A few weeks ago, I harvested a ton of herbs and greens that were not being used in the garden. I wanted to find a way to save them to use throughout the year when there are not as many wonderful things to eat from the garden. I used some of the basil to make a nut free version of Pesto, and the kids and I used some of it to make some yummy kale chips. But I still had bunches of herbs and greens to use, so I decided to dehydrate them. Dehydrated foods take up less space for storage, lose very little nutritional value, and are easy to store without the use of electricity. You can dehydrate greens in no time and have a powerhouse of nutrition to use later. To dehydrate greens or herbs, wash them thoroughly and spin them dry. 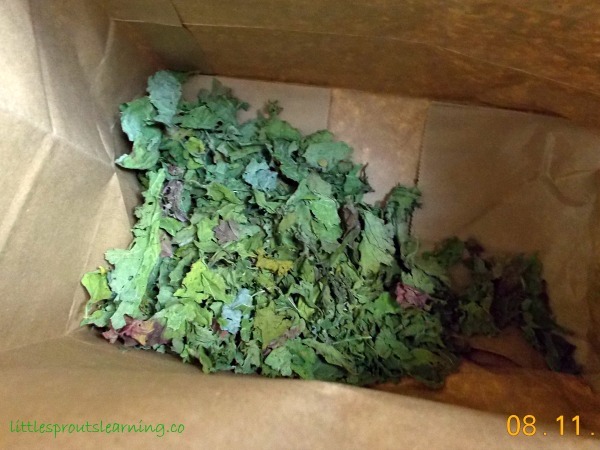 You can dehydrate kale, spinach, swiss chard, broccoli or cauliflower leaves, turnip and mustard greens, radish greens, lettuce, arugula and so much more. Any greens you have going to waste in your garden can be dried and used later. Dry the greens thoroughly. Dry greens take less time to dehydrate. You can dehydrate greens and herbs in your oven, but I like the dehydrator because it uses less electricity and doesn’t heat up the house as much. The mix of greens will dehydrate in just a few hours. When the greens are dry, you can place them in a large paper bag and crunch them up into powder. For a finer powder, you can also grind them up in the blender. Did you know you can even dehydrate and use carrot tops? Click here to see how. 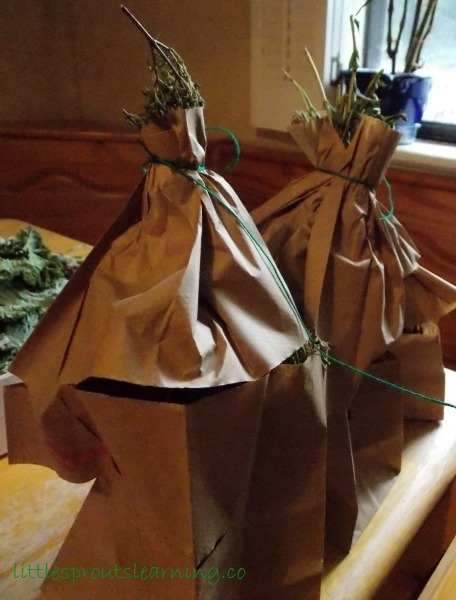 You can easily dehydrate herbs in a paper sack to save electricity and heat in the house. Herbs dry great like this. I am going to mix my dried herbs and make my own Italian seasoning mix to use throughout the year and give as Christmas gifts. Another electricity-freeway of drying herbs and greens is using a sun oven. 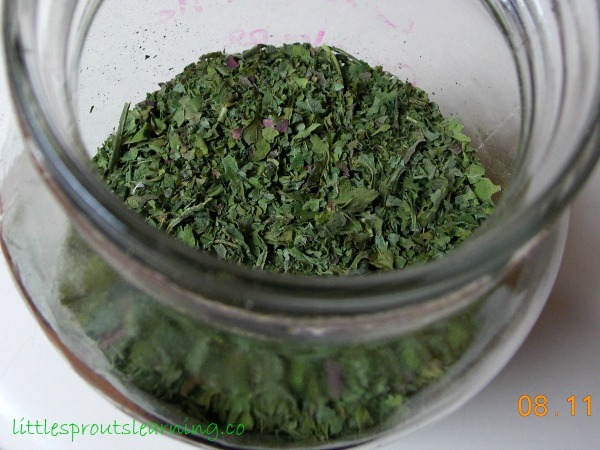 Click here to see how you can dehydrate herbs or greens in a sun oven. You know what else? 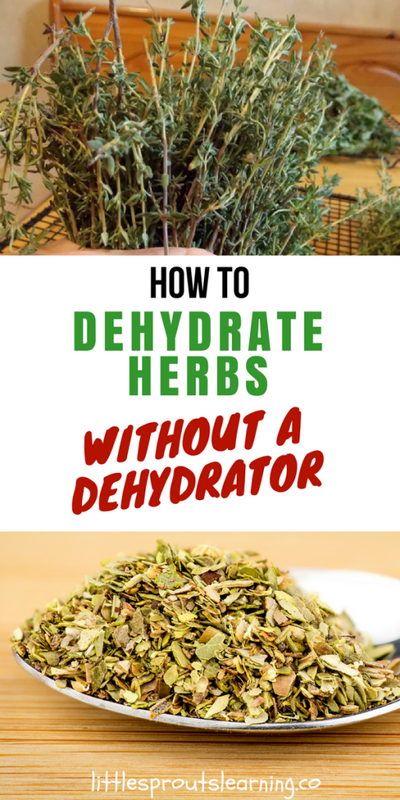 If you don’t have a sun oven, you can even dehydrate your herbs and greens in your CAR! Click here to see how to do it. I bet it makes your car smell GREAT too! 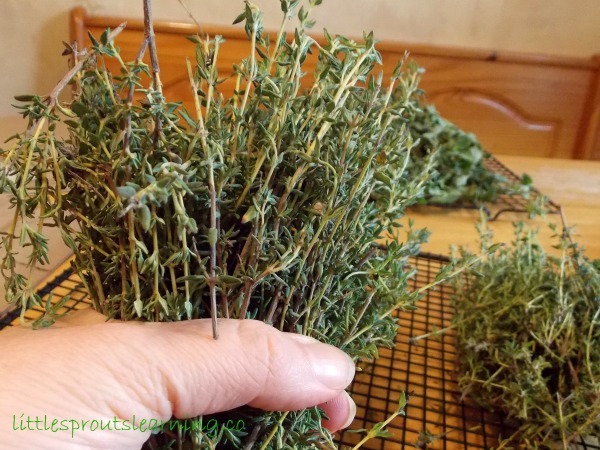 Bunch a handful of herbs in your hand and tie them with a string or rubber band. Set them in a paper bags that has slits cut in it. Bunch up the end of the bad including the herb stems in the bunch and tie a string around it. Hanging the bag helps air get to all sides of the herbs through the slits cut in the bag and helps the herbs dehydrate without getting moldy. The bag keeps the herbs from getting dusty as well. Hang up for a couple of weeks and the herbs will be crisp and ready to crunch with your fingers and place in airtight jars for storage. Carefully strip the herbs from the stems and place them in your jars. 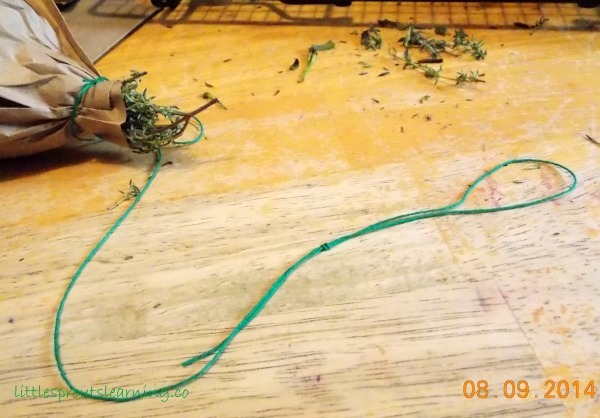 What can you do with green powder once you make it? It’s a superfood! Dehydrating greens preserves most of the nutrients with the exception of some of the vitamin C. It’s a great nutritional supplement. Just sprinkle it in or on whatever you’re cooking. If you have picky eaters, green powder is a great way to hide vegetables in their food. 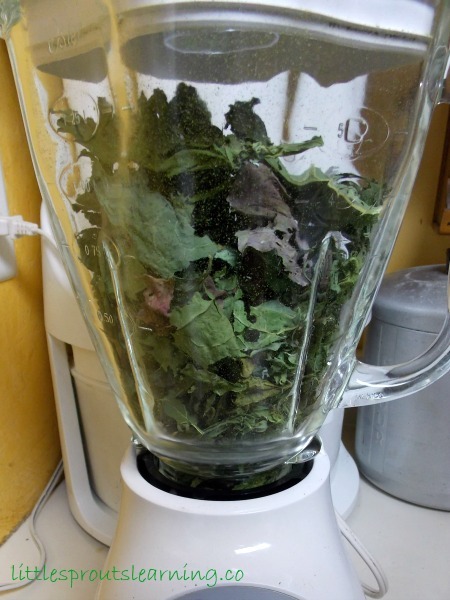 A serving of greens dries down to just a few teaspoons of powder. You can hide it in your pizza or spaghetti sauce or mix it with eggs. It looks like herbs and you can’t taste it. Click here for more ways to hide nutrients for picky eaters. I feel good about boosting the nutrients in the food I serve with green powder. And my excess greens aren’t going to waste. I feel like a superstar. Also, I know we can use that nutrition when the garden season is over. Winter time is when we need it most. You can also chop it up and freeze it in one cup portions to drop into soups and casseroles. What are some ways you preserve the harvest? Superb content you have right here. 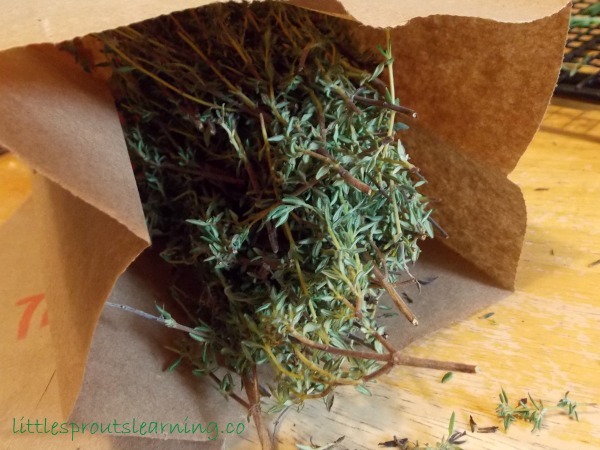 We love dried or freeze dried herbs. Such a great resource! I started an herb garden this year and thank you for this information. I want to do this and am excited to see the ending product when it is done. I look forward to using my own home grown herbs this Fall and Winter! You’re so welcome, i’m glad it was useful. It’s so fun to learn new things. I’m glad you liked it. Thank you for reading! Thanks a lot , this is the best way of preserving food mostly the nutrients. This is a great way to preserve the harvest! I have never considered drying greens, but it seems like a great way to add some nutritional punch to lots of food during the winter. It worked great. Thanks for reading! Thank you for the ideas and step-by-step tutorial. Dried herbs are so expensive and these are basically free. I’ve never had dried greens, but I would love to sneak more spinach and any kale at all into my daughter’s diet. Free is awesome! AND they are package free. 🙂 I have used the green powder in the kid’s food several times with no detection. 😉 Every little bit helps. Thanks! And thank you for reading!